I was editing a document in Office Word 2007 on Windows XP and suddenly all sorts of words are underlined as misspelled. I go into Word options and it talks about French dictionary! In the preferences, my primary language is set to English (US) and that is only language set. What is going on??? How can I get back to English spell check? To fix issue like this in Microsoft Word where the Synonyms for a particular document is in different language or the proofing language/spell check is changed to French, Spanish, etc; First select all the document (shortcut Ctrl + A) and navigate to Review Tab > Language > Set Proofing Language and then in the pop up , make sure the check-box "Detect language automatically" is unchecked. In case of Word 2007, go to Review tab, then to Set language, and then to the language of your choice (English). I think that should fix it. 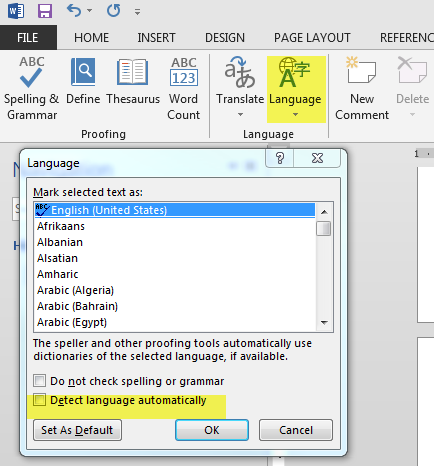 Word tries detecting the language as you type. This works fairly well when you got like 5 to ten words minimum and eventually provides you with correct spell-checking even in multi-lingual documents. Word switches the language based on the input language. I have Polish installed as input language, along with the proper keyboard layout and when I switch to that in Word I get spell-checking in the correct language. The easiest immediate fix is probably to select all, then click the language in the status bar and select English. It might be that your default style is set to French (for whichever reason; that usually doesn't happen automatically); you may want to set the language there too. I encountered in PPT 2007 where I was typing text in and suddenly normal words, such as "your" and "windows", were being highlighted as being incorrect. I right-clicked on the misspelled words and the spelling showed what I beleive was French spelling. I looked at the main dictionary and English was selected. As mentioned above, I also went into the REVIEW>LANGUAGE, scrolled through the list and selected English (US), even though it was already highlighted, and then clicked default. The wording that was marked as incorrect was now correct. I can only guess that I had accidently hit a key combination while typing that forced a different dictionary. Not the answer you're looking for? Browse other questions tagged microsoft-word-2007 dictionary english or ask your own question. Why is Word 2007 not allowing me to select or edit above text with cursor? How to add a language dictionary to Word 2007?